The RS808 is the TR808’s analog Rimshot and Claves sound generator in Eurorack format. 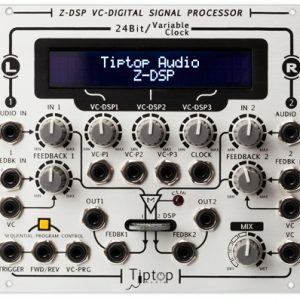 It’s a low-cost module that brings back that classic sound, but with even more variation and control, continuing to expand your TipTop Audio modular drum machine. The RS808 comes with two switches that give you a total of 4 different positions: two are the classic Rimshot Clavs sounds as found on the original, and two are unique to the RS808 module adding a range of snappy “click” sounds the circuit is capable of producing. 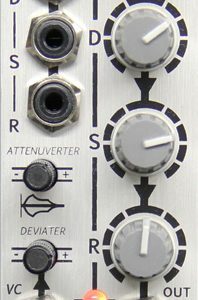 Two control knobs were added, each have different effect for the selected sound. In general, these controls can be categorized as Pitch and Snap as they control the frequncy of the oscillator and decay of the envelope generator. The RS808 is an exact reproduction of the original circuit which sounds like a fresh machine coming off the assembly line back in the 80’s. Compatible with all the other drums in the series, the RS808 includes a hot modular level output gain stage capable of producing signals that can be easily distorted if desired. 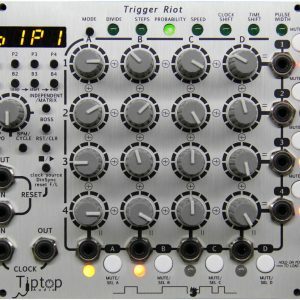 On the inputs, TipTop designed a dual-input pulse-shaper circuit so you can trigger the RS808 with trigger/gate signals from the step sequencers, clock dividers, or any other pulse/click sources. This eliminates the need to shape pulses sent to the module ensuring the same stable sound at peak power, regardless of your pulse source. These distinctive features make integrating this legendary sound generator into your modular synth easy, unleashing the power of real analog drums.